I was talking to a wealth manager a few months back. She had a client in a sticky situation. The husband and wife have a great business. They are successful beyond what they ever imagined. Beautiful lifestyle. Amazing children in the best universities. They always thought that the business would give them the retirement of their dreams. Just one problem. He is suing her for divorce. The assets of the relationship include the business. She wants her share of the value of the business. He has other plans. The wealth manager wants to know whom I would recommend to have a valuation done. Well the right answer is not whether the valuation is needed, but what kind of advisors are needed to get to the finish line, if even a profitable finish line can be found. This is an exit event we call one of life’s curve balls. 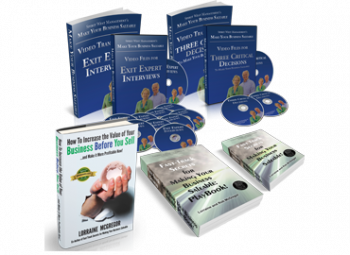 The business owner always thinks they will exit one day. But then the curve ball supplies the date. Imagine, not having control over when you exit, how much the company will be worth and whether it can even attract a buyer. Imagine being at the mercy of life’s circumstances. That’s like being given a winning lottery ticket, and losing it before cashing it in. No ticket, no payday. Who loses? All the players. But since it’s the business that has all the value, and that’s what the players are counting on, it should follow that husband and wife should care the most about ensuring their company’s value doesn’t diminish while they sort out their dissolution. But you know how this story is going. It’s an ugly divorce. The husband is letting the business lag so it’s not worth as much as it used to be. His top priority is revenge. The wife won’t go into work to do her job, so she doesn’t have to see her husband. Her top priority is moving on fast. No one is looking out for the company that could take care of everyone’s interests. Ok, maybe not the revenge part. The company loses two functional employees and its rudder. That means the company’s reputation and brand suffer. And employees are left to juggle the day-to-day work. How long will they do that for? Employees don’t have to know the details. They read the owners’ body language and behavior and then draw their own conclusions. So here’s the answer for this miserable situation. If the valuation has to be shown in court, and there will likely be an argument about the number and it needs to stand up to scrutiny. It should be done by chartered business valuation expert. But the wife will need cooperation from the husband to get the data. It can take weeks to dig through accounting records and extract the data to prove out a valuation. So step one starts with a call to the company’s accountant. Don’t start talking to a valuation expert until you know that you have three years of audited financial statements. The next step is to evaluate the company’s prospects for sale. If the company is likely to be put up for sale, then going to a business broker is the best way to get the valuation done as the broker would do it as a first step. But this only works if the couple are not in the court system yet. If the husband wants (or the court decides) to sell the company then at least he would recognize the need to provide financial statements, as selling is in his best interests, despite how he feels about his wife. But hey, sometimes spite beats logic in stressful situations. However if the business still depends on the husband and wife to be in functional roles, then the business may not be saleable at all. If this dispute continues, and it is affecting the business, key employees might leave taking away critical skills, experience and knowledge vital to the business. That’s like taking the alternator from your car yet expecting it to still run. If the company has not been profitable in any of the last 3 years, then a valuation is almost a moot point. No profits and no value, except that of any assets. If this is the case then you can take the list of assets to auctioneers to determine the blue book value. 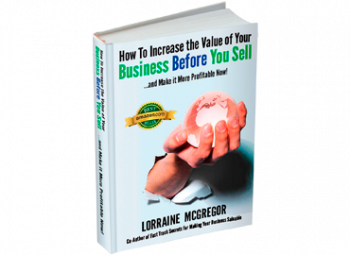 The total blue book of all assets will be the value of the business. If the business has had increasing sales over the last three years, but has not been profitable, then the company may have been managed for profit. It’s being managed for tax minimization. The benefit of getting a broker to do a valuation is that they will “normalize” earnings, taking out all the tax minimization tactics and one time costs as well as excess management fees to determine true value. But then there is still the question of whether a buyer would find this business worth acquiring if the husband and wife are key employees driving the business. No management team means too much risk for the buyer. So who are you going to call? Start with a mediator or collaborative law specialist who can save the business from being tarnished by the end of the marriage. Deal with it privately before the court decides on everyone’s behalf. Better yet, start by learning how to make your business saleable long before, so when life’s curve ball comes calling, you’ve still got control of the wheel. Then you can sell when you want, for what you want despite disease, divorce or death. So who are you going to call so you aren’t left with a bag of rocks for all the years you invested in your business? Start by having a talk with yourself and your spouse or partners. How do you want your exit to end? 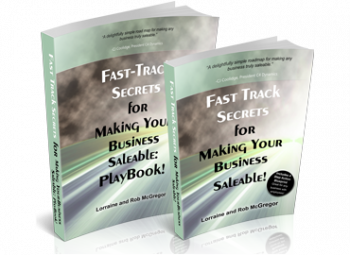 Get your Saleability Blueprint built and start implementing it. And what of the husband and wife? I hear he closed the business after his key employees left. The valuation became a moot point. But he kept his spite and she got to move on.